Carlos Contreras, driver of the No. 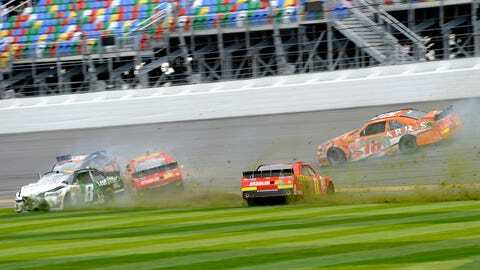 15 Chevrolet, gets caught right in the middle of this massive wreck during Xfiniity Series qualifying on Saturday at Daytona. Frustrations over NASCAR’s new group qualifying format boiled over Saturday afternoon as five cars wrecked attempting to make the Xfinity Series season opener at Daytona International Speedway. For Rick Ware Racing’s Carlos Contreras, the frustration was centered on not only the new group qualifying format, but also rookie Daniel Suarez. The first car off the line in his group session, Contreras was surprised when he looked in his mirror and did not see any cars behind him on the track. With no help from behind and following the No. 01 Chevrolet of Landon Cassill, the pack caught Contreras in Turn 3 and he went low trying to tag along in an effort to post a solid qualifying lap. Running much slower than the pack, Contreras was hoping to pick up the draft with help from Suarez. However, Suarez made an evasive move to the outside, made contact with Blake Koch to his right, and was sent back down the track into the right rear of Contreras’ car. The contact sent Contreras head-on into the outside wall at full speed, and ruined his chances at making Saturday’s race since the team does not have a backup car. "Man, it was the worst, worst wreck I’ve ever had," Contreras told FOXSports.com. "I saw the wall in front of me and I knew it was going to be bad. I’m very happy with NASCAR for the soft walls, the HANS device, the seats, the technology; they saved my life and they’ve saved a lot of lives. "At the same time, I’m frustrated. I have a broken heart right now." Although not seriously hurt, the hard impact left Contreras battered, bruised and nursing a banged-up right ankle after knocking between the gas and brake pedals. That frustration was primarily directed at Suarez, someone Contreras considers a friend. Contreras has not spoken with the 23-year-old Joe Gibbs Racing driver, and does not plan to do so for at least a month. "It was a hard, hard, hard hit," he said. "I was lucky. I’m sore, but I’m still here. Daniel, he’s a rookie driver, he has a lot of talent, he has the best team in the series, he has the sponsors behind him. He has everything. He has the age, he’s a nice guy." Looking in the mirror, Contreras was happy to see his fellow Mexican racer behind him, but at the last minute Suarez made the move to the outside and triggered the five-car wreck. "My car is completely, completely destroyed, and I’m pissed," said Contreras. "I’m pissed with him right now. He has to learn. He has the talent. I really like him. He has the talent, the sponsors. The best opportunity for a Hispanic driver is Daniel Suarez, but he’s still a rookie. He needs to learn."